Bawley Point Bungalows offers their beautiful, self contained bungalows throughout the year. Walk-in are welcome if there is an available bungalow. Sofa bed additional, $30 linen fee, $100 security bond applies on all stays. Full payment required 4 weeks prior to check in. We accept VISA and Mastercard or you can direct deposit to our bungalows account. The four bungalows are ideally suited to couples, but can comfortably sleep up to 4 people with the sofa bed in the lounge area. They all have reverse cycle air conditioning and a fully self contained kitchen (including dishwasher). You can dine alfresco on the deck and barbecue area. Each bungalow has one bedroom with queen size bed and ceiling fan, lounge area with television, video, compact disk player and sofa bed. All linen is supplied. Bathroom has spa bath and hair dryer. Beautiful timber floors feature throughout. The bungalows kitchens have everything you need to cook up a storm with your own dining area, or you can dine alfresco on the small deck area and BBQ your catch of the day. After all the outdoor activities, enjoy a soak in the spa bath with a glass of wine from the local winery to end your day. 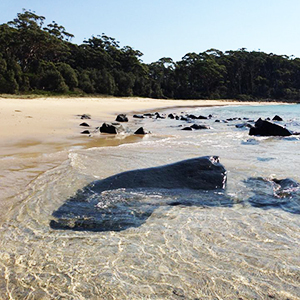 The bungalows are only a five minute stroll to the beautiful pristine beaches for which Bawley Point is famous. Enjoy surfing, fishing, snorkelling, paddle boarding, diving or just relaxing on the sand watching the dolphins frolic. At Bawley Point Bungalows, wildlife comes to your door ... including wallabies and many varieties of bird life. Lorikeets, rosellas, king parrots & even black cockatoos.